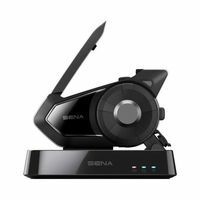 Utilizing two antennae and two separate and dedicated processors, the Sena 30K is both a 4.1 Bluetooth headset and an Adaptive Mesh-Networking device, the two working simultaneously in concert within one low-profile unit to accomplish all your communication and entertainment needs. Sena 30K Audio Multitasking technology allows you to have a conversation via Adaptive Mesh-Networking technology while simultaneously enjoying Bluetooth operations such as streaming smartphone music, taking or making phone calls, or listening to turn-by-turn GPS navigation, so there is no clunky navigation between devices or channels or frustrating re-pairing of devices. Promising the smoothest, most uninterrupted listening experience ever, the Sena 30K is a huge technological leap forward – simplicity through sophistication, so you can focus on the important part: enjoying the ride. Using the private group mode, the 30K can pair in full duplex communication with up to 16 riders at a range up of to 1.2 miles, while an endless amount of additional Guest users can tune in for listening only. When riding with 5 or more riders, the Mesh Intercom is capable of keeping the group connected at a range of up to 5 miles. Although Mesh Intercom is the next big thing, you won’t leave your Bluetooth buddies in the dust either. The 30K is still capable of pairing with up to 3 other Sena or non-Sena Bluetooth communicators at a range of up to 1 mile, depending on the range of your riding buddies’ headsets. Using Sena’s RideConnected Mobile App, the 30K is also able to connect with riders anywhere in the world via your mobile network. The included WiFi docking station allows you to charge up your 30K and wirelessly update the firmware as needed.